Opportunistic imaging gets more data from existing scans. As health care providers move toward value-based care, doing more with less will be on everybody's agenda. Because of the large amounts of data associated with medical images, imaging is one specialty that is already on the radar. From quantitative measurements to opportunistic imaging, people and organizations are asking how they can get more information from medical images. One area that may benefit significantly from a new approach is osteoporosis screening. The International Osteoporosis Foundation (IOF) estimates that osteoporosis causes 8.9 million bone fractures worldwide each year. Osteopenia, a less severe type of bone loss, also raises fracture risk. Among the most serious types of fracture are hip fractures, which are associated with chronic pain, reduced mobility, disability, loss of independence, and increased mortality rates. The IOF estimates that 75% of hip fractures occur in women, but the rate of mortality from hip fracture is higher in men. The IOF also estimates that, worldwide, 1 in 3 women older than 50 and 1 in 5 men older than 50 will experience osteoporotic fractures. Out of approximately 9 million osteoporotic fractures in 2000, 1.6 million were hip fractures, according to IOF estimates. Finding ways to identify those most at risk for fractures could significantly improve prevention and save millions of dollars. Perry J. Pickhardt, MD, a professor of radiology and the chief of gastrointestinal imaging at the University of Wisconsin School of Medicine and Public Health, says body CT is a commonly performed procedure, particularly in older adults, that could yield additional insights about a patient's bone health, among other things. Although CT has been criticized over the years for picking up incidental tumors with no clinical significance, so-called incidentalomas, Pickhardt believes there are many opportunities to derive additional value from CT data. For example, a patient being screened with CT colonography could also be screened for abdominal aortic aneurysm and osteoporosis with the same scan. Other exams offer possibilities for opportunistic evaluation, as well. "I think opportunistic osteoporosis screening has perhaps the most value because CT has very rich bone data embedded within every scan, much more robust than the standard DXA [dual-energy X-ray absorptiometry] scan that is currently performed for osteoporosis screening," Pickhardt says. "And even though we're kind of stuck with [DXA screening] as the reference standard, so to speak, we can still turn these CT scans into DXA-equivalent exams, at the very least." In 2013, Pickhardt and colleagues published a study in the Annals of Internal Medicine that compared bone mineral density (BMD) measurements from DXA and CT scans performed for other indications to determine whether CT for other indications was an acceptable means of identifying patients with osteoporosis. The study, which was conducted over a 10-year period, compared the results of 1,867 patients who received both abdominal CT and DXA of the hips and spine within six months of each other. The study found that CT for other indications is able to identify patients with osteoporosis. There are a few methods for obtaining opportunistic data, but Pickhardt's preferred method is currently asynchronous quantitative CT (aQCT). Mindways' aQCT is an FDA- and CE [European Conformity]-approved software application for Microsoft Windows that can be installed on a PC. Images are sent to the PC from a CT scanner or PACS for analysis. One PC can be linked to many scanners. Pickhardt says the University of Wisconsin is currently building aQCT into its Epic EHR so that it will pop up automatically and ask whether a clinician wants to check for osteoporosis, in addition to the initial clinical indication for the study. "It doesn't require any additional scanning or patient time. 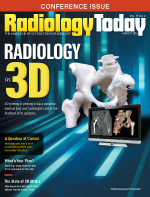 It's really just the standard CT images being sent to the Mindways software program, and our CT technologists can derive DXA-equivalent BMD results in just a few minutes," Pickhardt says. "It's a pretty streamlined system and not very difficult for others to employ." Approximately 85 million total CT scans were done in the United States in 2011. Pickhardt says the majority of them were body CT scans performed on older adults. He estimates that aQCT could be applied to tens of millions of pelvic CT scans for patients older than 65 years of age to measure bone mineral density. He adds that this type of screening would incur virtually no additional cost, aside from a small professional fee that is only 10% of a DXA study, and save patients the time and inconvenience of scheduling multiple exams for multiple conditions. "The bottom line is, although CT scans are generally ordered for a certain indication, the additional data can be effectively utilized to add value to patient care. The beauty of cross-sectional imaging—and some people would say the curse of it—is that it includes a lot more information than what you're asking for," Pickhardt says. "It's been considered a negative that we find many incidentalomas, so to speak, and that is a legitimate concern, but if you view it a different way, there are also a lot of opportunities to extract useful information that is largely being ignored because it wasn't part of the study indication. And a lot of these opportunities can be applied as screening paradigms, such as for osteoporosis or abdominal aortic aneurysm."